Paybooks is on a mission to make payroll simple and delightful for businesses. Since 2012, we have helped 3,000+ businesses across India in automating their payroll, staying compliant with laws, and delighting their employees. 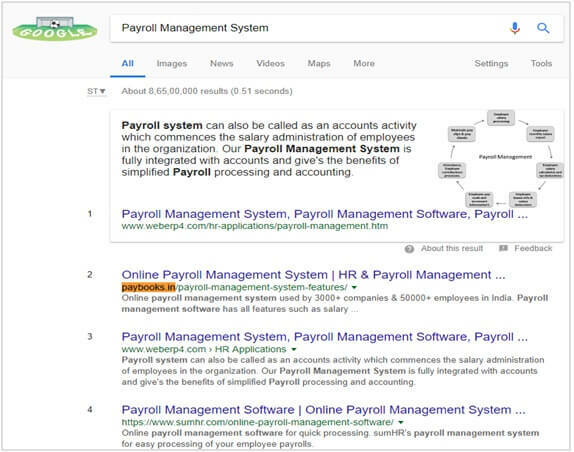 Before partnering with EZ Rankings, Paybooks Technologies India Private Limited attempted to create online presence in the India market, as Paybooks brand name they require a SEO marketing firms to promote their Payroll and HR services and want 1st page ranking and more enquires through online search. However, the results did not meet expectations. As Paybooks Technologies required the right combination of marketing knowledge and digital experience to improve its SEO organic rankings as well as wants more enquires and sales. EZ Rankings analyse the whole requirement and stepped out the marketing action plan to meet client objectives. We have put our hard efforts and were on top of the Google SERPs for most of the keywords that drive traffic to the website and enhance the sales as well.